DEI studied soft-shell clam recruitment in the St. George River and Westkeag River in Thomaston and South Thomaston in 2017 and Thomaston in 2018. In June 2017, a series of soft-shell clam recruitment boxes were deployed at four sites in Thomaston and South Thomaston (three in the upper St. George River; one in the upper Weskeag River). Four study locations for the 2017 St. George and Weskeag River recruitment box study. Read a description of the 2017 study sites and initial baseline survey here. Boxes were retrieved and analyzed in the late fall of 2017. In the upper part of the St. George River, soft-shell clam populations are not limited by the lack of clam post-larvae that settle onto intertidal flats. There’s plenty of clam larvae in the water column over a mudflat at high tide. At sites where average clam abundance was relatively high (Neil’s & GRLT – low), variability in juvenile clam numbers between boxes was quite high. As many as 2,296 clams occurred in one box (GRLT – Low). This is 1,422 clams per sq. ft.
No clam juveniles were found in boxes at two sites (GRLT – Upper & Mid). 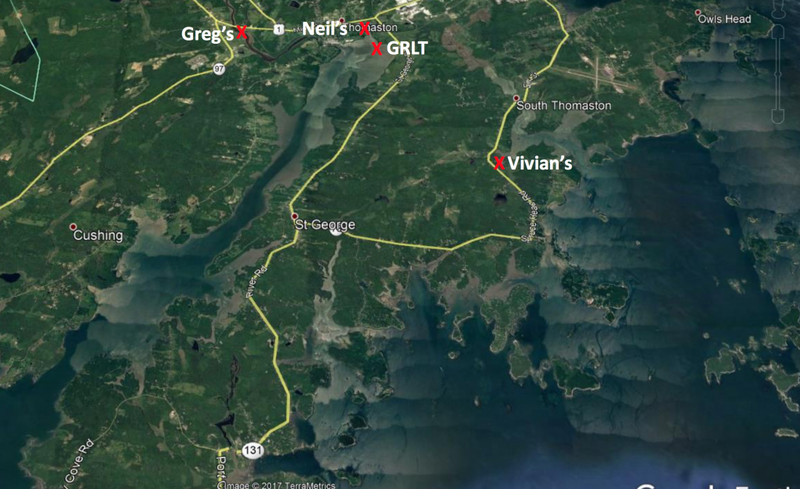 For sites with clams, the GRLT – Low site had the highest average # (867 per sq. ft. ), and Vivian’s the lowest (3 per sq. ft.). Clams in boxes ranged from 1.9 mm to 21.3 mm (≈ 1/12th to 3/4th inches). For sites where average clam abundance was greater than zero, there was, in most cases, a negative relationship between the number of clams and the biomass of green crabs in a box. Green crabs settled into boxes at every site, and ranged in size from 3.3 mm to 37.3 mm. Green crabs are likely responsible for a large percentage of clam mortality in the Upper St. George River. In 2018 we deployed five recruitment boxes at each tidal height in one cove (Neil’s) in Thomaston. This cove was one of the locations used in the 2017 study. Clams were collected from June to December. An average of 1,096 clams per sq. ft. in the low. An average of 116 clams per sq. ft. in the mid. An average of 115 clams per sq. ft. in the high. 4 clams per sq. ft. in the low. 2 per sq. ft. in the mid. 3 clams per sq.ft in the high.